When your life is over, everything you did will be represented by a single dash between two dates - what will that dash mean for the people you have known and loved? As Joseph Epstein once said, 'We do not choose to be born. We do not choose our parents, or the country of our birth. We do not, most of us, choose to die.... But within this realm of choicelessness, we do choose how we live.' And that is what 'The Dash' is all about. 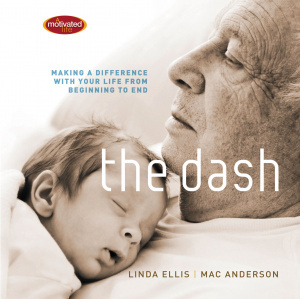 Beginning with an inspiring poem by Linda Ellis titled 'The Dash,' renowned author Mac Anderson then applies his own signature commentary on how the poem motivates us to make certain choices in our lives - choices to ignore the calls of selfishness and instead reach out to others, using our God-given abilities to brighten their days and lighten their loads. After all, at the end of life, how we will be remembered - whether our dash represents a full, joyous life of seeking God's glory, or merely the space between birth and death - will be entirely up to the people we've left behind, the lives we've changed. Dash : Living A Beautiful Life From Beginning To End by Linda Ellis; Mac Anderson was published by Thomas Nelson in April 2012 and is our 9824th best seller. The ISBN for Dash : Living A Beautiful Life From Beginning To End is 9781400319985. Be the first to review Dash : Living A Beautiful Life From Beginning To End! Got a question? No problem! Just click here to ask us about Dash : Living A Beautiful Life From Beginning To End.